As my regular readers already know, I recently set-up VoIP phone service for my computer consulting business. I learned there are a few things that should be considered in order to get the most value out of your number. Toll Free or Local? – The first thing you’ll need to decide is what category of phone number you’ll be choosing. Do you want to do business with customers in different area codes? Will they have to call long distance in order to reach you on your local number? Not only will a toll free number allow customers to call you from any location without incurring long distance charges, but it also gives your business a professional boost, making it appear on par with the national chains. That may or may not be the reputation you want to project. I’m starting my business out with a local number for two reasons. One, I want my business to have a local “neighborhood computer guy” feel to it. Two, I don’t plan on doing business outside of my local county for the foreseeable future. If I ever plan on taking on customers from other areas, I may consider adding a toll-free number to compliment, not replace, my local number. To Spell or Not to Spell – One of the easiest ways to make your phone number memorable is to make it spell something, like 1800flowers. This costs extra and the word you want to spell may not be available in number form. This becomes important when you’re trying to build a national brand with your business. It may be fun and tempting, but I’d argue that this isn’t entirely necessary for local or small business. Unless your business name is one that’s well known to your potential customers, they’ll probably forget your number, even if it DOES spell something, since they’re not familiar with your business name to begin with. If you do go with a number that spells something, at least include the number by itself as well to avoid confusion. 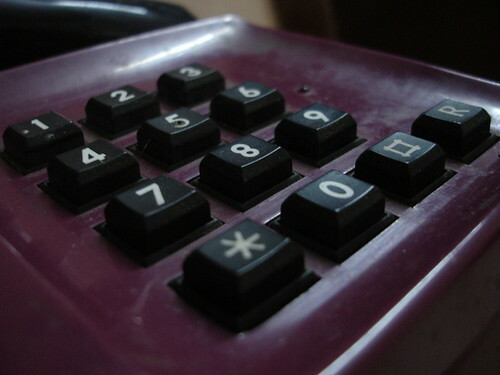 There have been a few businesses that I’ve avoided calling in the past because I wasn’t able to see the letters on the tiny number buttons on my cell phone. Patterns and Rhymes – An alternative to the number that spells something is the number that includes patterns that make it easy to remember. Repeating numbers can be very helpful, like 443-4443 or 444-5555. Also, repeating patterns like 123-1231 or 121-2121 are good to consider. Another thing to look for is the possibility of the number rhyming with your business name. As a ficticious example, I could use the number 868-5463 in a slogan for my business, Jiffy-PC. It would go like this: “Call Jiffy-PC at eight-six-eight fifty-four sixty-THREE”. “Three” rhymes with PC. Mother Goose would be proud! Although I’m not going to publish my number here, I did employ a few of these tactics in my own number, specifically repeating, in order to help it “stick” in the minds of my customers. Now go forth and choose a number that’s memorable! In my experience as a friendly neighborhood computer guy, I have not found that my phone number had any effect on whether clients chose me over anyone else. When clients have your business card, or get your number from a friend – they’ll remember you if your rates are reasonable and you did a good job. Thinking deeply about a spelled out, toll free, or rhyming and patterned number are probably not very important when starting out. Though I’d be interested if your experience shows you otherwise. Good to hear from you Oleg! You know, I’m not sure that a catchy phone number makes that big a difference, or any at all, in the grand scheme of business planning. But I figure it’s such an easy thing to consider, and something that couldn’t hurt, why not? I don’t think you’ll ever know if you gained or lost a customer because of your phone number. All I know is that an easy-to-memorize phone number will ensure that it’s that much easier for a customer to call you when they don’t have your card handy. As a business owner, you want to make sure that you make it as easy as possible for customers to contact you. I am glad you didn’t chose a phone number that spells something. They actually irritate me because I don’t want to have to figure out which letter goes to which number. As a consumer, the way a phone number looks or sounds is not that imortant to me. I don’t plan on memorizing the number anyway. I agree with you on the spelling thing…that’s why in my article I suggested businesses include the “number” version of their phone number beside the “word” version in their advertising. The thing about a catchy phone number (or business name, or website) is that you never PLAN on memorizing it, it just sticks with you whether you like it or not. Don’t forget, a lot of the things businesses do to attract and keep customers do not necessarily appear important on the surface. Like I told Oleg, I want my customers to be able to remember how to contact me when they want, even if my business card or flyer isn’t handy. Call 507-514-0898 for a good time!